Long before the first Europeans landed on the New World shores, Native Americans cultivated and smoked tobacco in religious ceremonies and used it to treat a wide variety of maladies. Cultivation sites in Mexico date back to 1600–1400 BCE. While the Spanish introduced tobacco to Europe in 1518, it was John Rolfe, an early English settler, who first successfully cultivated and exported tobacco as a lucrative cash crop in the Colony of Virginia in 1611. Prior to the twentieth century, tobacco was primarily chewed, snuffed, or smoked in pipes or cigars. In 1883, cigarettes were hand-rolled at four cigarettes per minute. That year, James Bonsack invented the automated cigarette-rolling machine that turned out two hundred per minute, causing the price to plummet. The coming decades saw the rise of the colossal American cigarette industry. Tobacco is processed from the leaves of plants of the genus Nicotiana, a member of the Solanaceae (nightshade) family, whose cousins include potatoes, tomatoes, eggplant, peppers, and petunias. After being harvested, the leaves are dried, cured, aged, and blended with other varieties ofN. tobaccum to produce distinctive flavors and tastes, and packaged. Cigarette US per capita consumption jumped from 54 in 1900 to 4,345 in 1963! In 1964, the US Surgeon General proclaimed that smoking was hazardous to the health. Smoking is an equal-opportunity health hazard affecting almost every body organ. There is incontrovertible evidence that smoking increases the risk of diseases of the cardiovascular system (heart attack, stroke), lungs (emphysema, chronic bronchitis), and a wide range of cancers. The World Health Organization has identified smoking as the greatest cause of preventable deaths worldwide. Most smokers know these dangers and yet continue to smoke. Why? They are addicted to nicotine, a naturally occurring, behaviorally active compound concentrated in the plant’s leaves. In the 1970s, Brown & Williamson, a major cigarette manufacturer, developed Y–1, a crossbred mixture of N. tobaccum and N. rustica that doubled the nicotine content to 6.5 percent from 3.2–3.5 percent. Y–1 continued to be incorporated in their cigarettes from 1991 until 1999. SEE ALSO: Plant-Derived Medicines (c. 60,000 BCE), Wheat: The Staff of Life (c. 11,000 BCE), Agriculture (c. 10,000 BCE), Rice Cultivation (c. 7000 BCE), Artificial Selection (Selective Breeding) (1760), Genetically Modified Crops (1982). 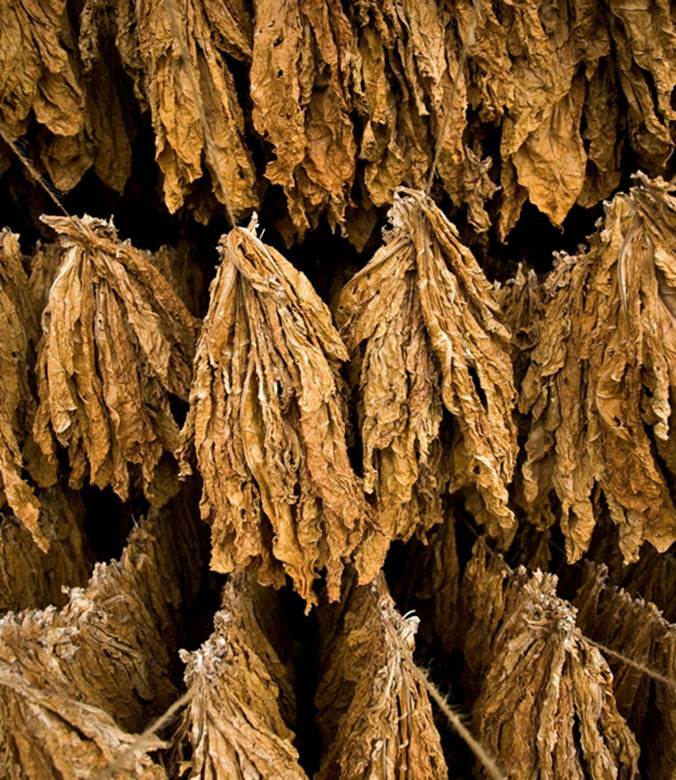 After being harvested, tobacco leaves are dried (cured) and aged to bring out their distinctive flavors and tastes. Tobacco can be cured by several methods, which take days to many weeks. The “flue cured” method for cigarette tobacco takes about a week and produces medium to high levels of nicotine.